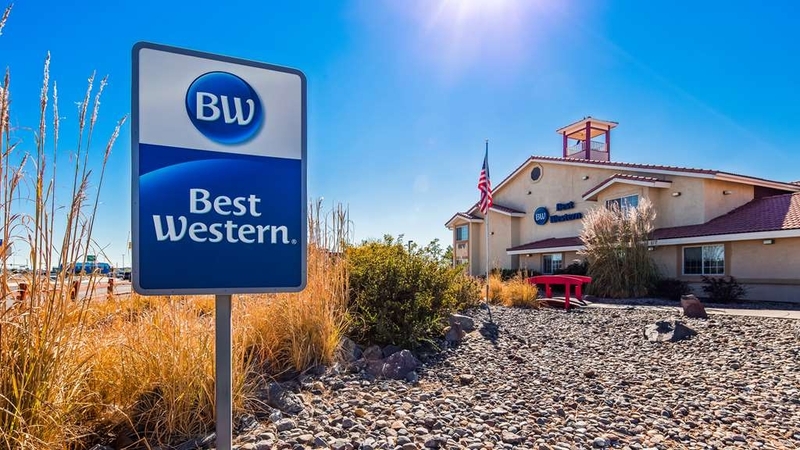 El Best Western Fernley Inn se encuentra en el centro de Fernley. Venga y disfrute de las mejores atracciónes turísticas cerca de nuestro hotel. Precios bajos garantizados y ofertas exclusivas. Tanto si se dirige al oeste a California como al sur hacia Las Vegas, no hay mejor lugar donde alojarse que el Best Western Fernley Inn. Convenientemente ubicado en el cruce de Nevada, a 48 kilómetros al este de Reno en la carretera interestatal 80 y Alt. 95. 95. Las colinas y las montañas crean espectaculares puestas de sol y amaneceres que rodean nuestro pequeño pueblo en el valle. El Best Western Fernley Inn dispone de una zona ajardinada con florecillas y árboles que dan sombra para ayudar a relajarse. Por supuesto, tiene casinos abiertos las 24 horas para los que disfrutan de la vida nocturna de Nevada. Todo esto se ofrece con un servicio cordial y otras comodidades. Disfrute de un fantástico desayuno completo por las mañanas con gofres de la marca Carbon's Golden Malted para mayor regocijo de todos los huéspedes. También ofrecemos una moderna decoración, instalaciones de lavandería, salas de reuniones, neveras y microondas a petición de los interesados. Visite nuestro hotel. The front deck person did not follow through with what they said they would do. I requested a room on the first floor and she said she would do that and when I arrived they put us on the second floor. The room was not clean and the bed was nasty. I would drive 100 miles before I ever stay in the hotel again. Dear Tim C: We appreciate your business. I am sorry that there was no note on your reservation that you made through Best Western. We can not guarantee a location of a room. We try our best to accommodate people but if there is no note in the reservation we can not follow through with the request. I apologize that you were angry because you did not get a ground floor. I would recommend that next time to call the hotel directly. Thank you again! Don't stay here! The room was disgusting, the beds are horrible and the breakfast was....... well non existent. We found hair all over the toilet, ick. The bed felt like concrete and when we went to eat there was no food and what they were offering was horrible and old. They also didn't offer enough seating. Don't waste your money here. Dear Flyer14377414: Thank you for staying with us. I am sorry to hear we did not meet your expectations. We normally get compliments about our beds. I am sorry to hear that you found them uncomfortable. The date you stayed the breakfast room was extremely busy. I am sorry there was no place to sit. You could have taken the food to your room. The food is put out fresh every day. I am sorry you did not like it. Best Regards! "Great Room at a Great Price :-)"
We had to stay here during a snow storm but was fine. Simple, Clean room with microwave and refrigerator in a safe area. There was a pretty good breakfast too. Pet friendly . We called 5 times and put on hold each time and then was disconnected but able to make our reservation on line instead easily. "In one day things could be changed to awesomeness..."
There is more than one really great things to say about this Best Western, so lets make a list... 1= The check in lady was awesome, she's doing a great job!, 2= I stayed in room 202 (a suite) and it had wood flooring!!! Wood flooring instantly makes the room feel cleaner, warmer, unique design... (If you like carpet then google the truth about carpet and read some of the articles.... I'm going to copy and paste one paragraph for you... "Carpets are a catch-all for dirt, with dust mites, pet hair, pet urine, dead skin cells, dust, insect feces, insect husks, bacteria, mold, volatile organic compounds, and many other types of allergens clinging to the fibers. ... In fact, dirty carpets can lead to serious health problems in otherwise healthy people".... I know chic's have a problem with cold feet and tend to like carpet but us men folk have a duty to protect them from themselves). Another great thing about this place is number 3= They have a really nice size solar array! The front desk lady stated that they save about $1700 a month with it = NEAT! So here are the bad things... the place mainly just needs to be better policed (cleaned) on the outside, my walk from the front office to my room 202 is a very short walk around the corner and then up the stairs but I could not believe all the trash which was about 60% cigarette butts from dirty nasty smokers (we should make all smokers live in New York city and then wall them off like the movie Escape from New York with Kurt Russel). To be fair, I arrived on an above freezing day after a snow storm came through and maybe all the butts were buried in the snow at one time? But there was also six pieces of trash in the 20 feet from the top of the stairs to my room and I can't seem to be able to think of an excuse for that... maybe a horned jackalope got into the trash when no one was looking? Also along the lines of cleanliness is that when I went to take a shower I noticed that there was a used old bar of soap on the top ledge of the shower along with a used shampoo bottle = what happens here is that the housekeeping staff are generally a smaller people and can't see that high up and it gets missed, whereas I'm 5 foot 14 and it's right at my eye level. Also, I would recommend the stairs get pressured washed but in general I would have gave this place 5 stars if the outside was cleaned up (I could have lived with the shower soap screw-up). One last thing... After meeting the morning girl working in the office and one of the housekeepers it seems like the entire staff is AWESOME and super friendly! Had a wonderful stay at this hotel. Very very clean room and nice and spacious. The front desk staff were willing to go beyond there call of duty for anything. My bed was super comfy with the amount of pillows and blankets. Got in late with our baby went to bed, woke up to make bottles noticed the place was filthy pubic hair everywhere in the bathroom. The water was cloudy couldn't even see through it, cleaned baby bottles with cold bottled water. Didnt shower the next morning as we found more hair in the beds we had slept in. 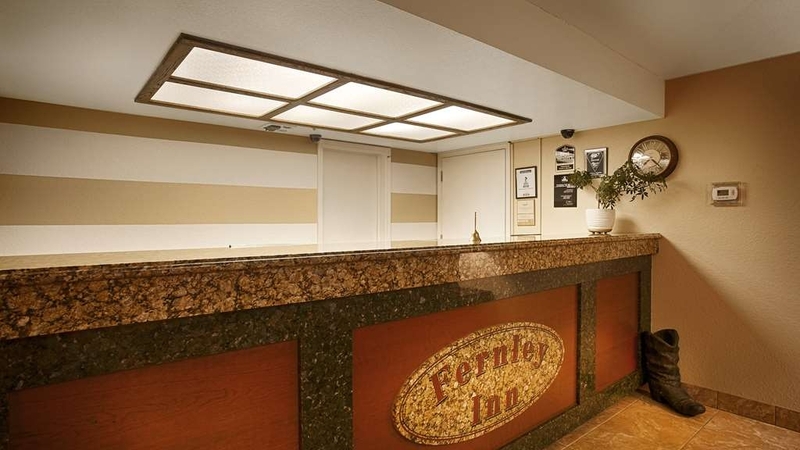 "Choose one of the other Fernley hotels"
Pros- Staff was amazing, woman that greeted us at check in was friendly and cheerful, check in and out was a breeze. Woman working the breakfast area was also a ray of sunshine. She was eager to help and worked hard. She worked on Thanksgiving and seemed happy to be there. The breakfast was great too, but I expected that because BW always has great breakfast. Cons- The rooms were definitely below the other two major hotels in Fernley, I have stayed at all of them and this is the worst. My sisters room smelled horrible when we entered, we found the source-- a dirty diaper left behind the door in the bathroom. My parents found bugs in their bed, and we were told we would get a discount, which we never saw. In my room the shower head fixture was loose and the piece that covers the hole in the wall was missing so you could see into the wall. Also, all 3 of our rooms had a clogged toilet at some point during our stay. The folks who work at this BW are very friendly, and always very accommodating. The property is clean and very basic. The pool, even though it's indoors, is closed during the winter. Good location with access to casinos, restaurants and stores. The contrast between this BW property and the one we stayed at the previous night in Cheyenne was pretty dramatic. You can really tell the different management styles of the individual properties by their attention to detail. The shower faucet in our not-so-clean room had multiple commercially prepared signs saying "Pull the Handle". At least two signs that probably cost as much as it would have cost to actually fix the darn faucet. The room was not terribly clean: hair in the drain of the sink and tub and dusty chest of drawers. I was surprised to see an envelope from "Maria" the maid asking for a tip. Unusual for a BW property. I will generally pick BW properties over any others when I'm on the road. Sometimes I'm going to get a less than average room. This was one of them. "Best Western with no frills"
Fernley is a strange little town, mostly a glorified truck stop close to the freeway, which is where this Best Western is located. 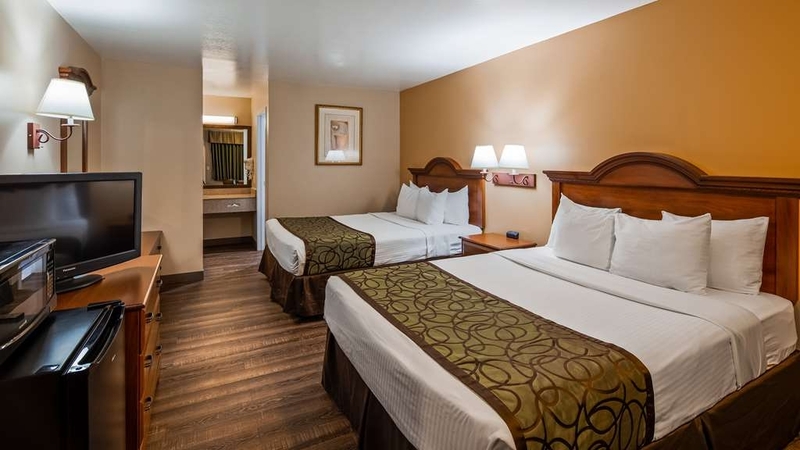 I was not disappointed with the accommodations—the staff was very friendly, the room was comfortable, I got a good night's sleep because it's far enough away from the freeway that you don't hear the noise. But this property is far from glamorous. It is located in an industrial/commercial area, across from a Walmart. There is no way to turn left out of the parking lot—you have to go about a quarter mile to the turn into Walmart to be able to get pointed in the right direction. I was unimpressed by the willingness of the hotel staff to accommodate a simple request for a late check-out; they ended up giving me an extra half-hour, despite my elite status with Best Western. The breakfast was pretty good, standard BW fare: scrambled eggs, meat, French toast or pancakes and the ubiquitous waffle machine. Overall, I was underwhelmed by the experience of staying there, and I am a Best Western loyalist, so it pains me to write that. Nonetheless, if I ever have to stay in Fernley again, I would stay at that hotel again. The experience was lackluster, but I want to stress that it wasn't *bad*. The hotel WiFi worked great, and sometimes that is all that matters. Stayed for 2 nights. Very friendly staff! Clean nice rooms! Very good hot breakfast! Three first morning, my husband had told the maid that we were traveling to see our son playa football game and the second day, she saw us walking to get breakfast and asked how the game was. Showed that she knew and remembered her guestsat the hotel. We will definitely stay there again if and when we return to the area! This is a great Best Western! The rooms are fabulous and very comfortable. Staff was friendly and the property is beautiful. So glad we picked the Best Western to stay at for our trip to the wonderful south entrance of Yosemite. "EXACTLY WHAT YOU EXPECT AT A BEST WESTERN"
This is not a fancy, super-expensive Ritz-Carlton or Four Seasons; it is a Best Western, a mid-price chain. And this Fernley BW is typical of Bes Westerns and is why I stay at BW's about 40 nights a year. 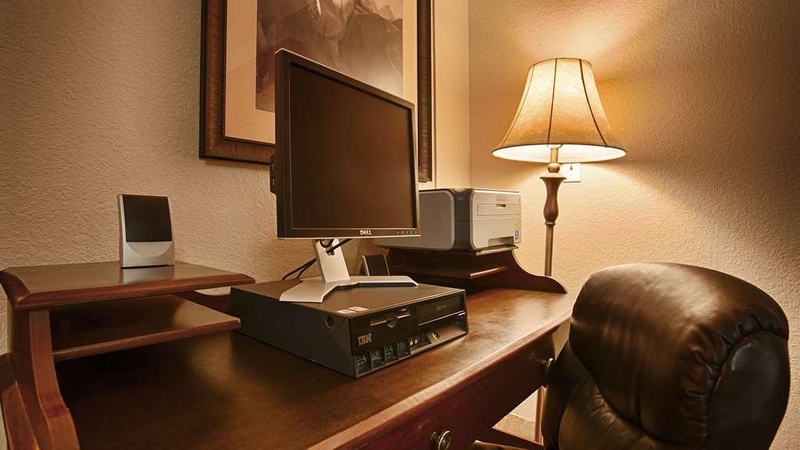 They are very clean, they are quiet and safe, and the rooms have every convenience you could want: Good WiFi, work desk and exec swivel chair. Very comfie king-size bed with good clean linen. Microwave, fridge, coffeemaker, iron and board, Good air-con. Spotless bathroom. It is a good value. And the management is friendly and helpful. I'll be back! "Not the best, maybe second best western"
I reviewed this hotel last year on Google. It was so terrible I wanted to give it no stars. This year it was improved. The remote worked, the clock worked, whatever was stinking like a sewer outside had been taken care of and there were no flies in our room. The decorating had been refreshed and I was quite impressed with the argan oil soaps, etc. The shower still had a layer of scum that was visible, but the thick layer of dirt and grime along the top edge of the tub enclosure had been mostly removed. They offer a fairly big selection for breakfast, but I wouldn't recommend the scrambled eggs, odd taste, maybe powdered eggs? Still on the pricey side, about $150.00 per night, but at least they're no longer completely unpleasant. "You get what you get and you don't get upset "
We stayed here on the way home from Salt Lake City. For $151, I expected better. But it was last minute on a Saturday night and nothing else was available on our budget. Never saw dirtier walls in a hotel but the bed was comfortable and relatively clean and the AC worked. Breakfast was stale breads, cereal and some hot fare. Staff were pleasant and efficient. We LOVED our stay here. The staff were amazingly friendly, welcoming and helpful throughout our stay. They are true animal lovers and happily offered ways to help make our stay more comfortable. We stayed here during our move from CA to CO and I can honestly say it was the absolute BEST hotel we stayed out during our entire trip.....it truly IS the BEST Western! The ONLY negative thing we can say about it is that we didn't have enough time during our trip to stay longer! I'd highly recommend the Best Western Ferey Inn at Fernley, NV. Thank you all for a wonderful stay! A decent spot to stop for the night. Price is right. Breakfast is nothing fancy. There was enough room for parking a truck and 30 ft trailer. Nice western decor in the lobby. Overall the stay was definitely good. "Uninformed staff, overpriced, mediocre room"
Staff person must have been new. Took 3 minutes to figure out if they had a room and had to remind her to give us the price, which was ridiculous for the location and average style, we thought (like $134 in heat of summer). We were about to walk away when she offered us the handicapped room for something a bit over $100. She confirmed that it had a bath (good for stiff joints from driving) and we took it sight unseen, being tired. Mistake. Not only did it lack a bath, but it was pretty plain Jane, the bed was not that comfy and the bed cover not really adequate. The swimming pool and hot tub were disappointing, in that whatever chemical they used to disinfect it clung to our skin and left a disagreeable smell. Next time I will read reviews on this area, which is about the only place to sleep trying to drive between Oregon and Arizona in two days. Dear Susan P: Thank you for selecting the Best Western Fernley Inn. Our prices are based on the area. I'm sorry you did not like them but you did have the choice not to stay. You would have found the prices the same or higher in the area. You are correct the clerk that checked you in was training. I'm sorry it took her so long but in her defense it was her first night. I'm sorry you did not enjoy the pool or the hot tub. We have only received compliments on those areas. I was very pleased with my room and breakfast. Staff lacked a certain polish but were adequate. The pool area was very nice and laundry facilities were good. The housekeeping staff were very polite which you don't see often. If you want a good deal...always plan ahead ??. When we arrived even the front desk was surprised (we reserved early). Very good space, two queen beds (enough room for 2 adults and 2 teens). Easy to find location, room ready and clean..a good choice for a one night stopover. Many easy food choices within walking distance. The staff was very friendly and helpful on recommendations on where to eat. Love the staff! The hotel is clean and comfortable. It has a great pooll!!!!! Breakfast is excellent, lots to choose from. The rooms are spacious and well maintained. 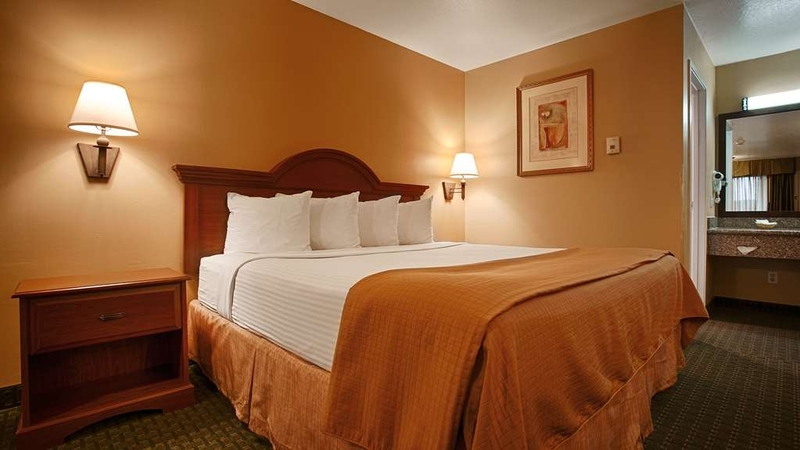 Conveniently located to restaurants and casino's as well as shopping. The Fernley hotel,a Best Western Motel, well we have always been pleased with standards at Best Western, my views have now changed. The receptionist who checked us in was very pleasant and clear with her instructions,about breakfast,wi-fi,etc,however we were soon bought to a halt after about 2-3 hours later.We found the shower difficult to operate,on calling the reception area there was no answer.Then after visiting the reception area I was met by a very "anti" receptionist and as I explained about the shower she huffed and puffed about reading the "instructions" for the operation of the shower, "instructions" For a shower ?? ?asking for her attendance caused further huffing and puffing.At last persuading the receptionist to attend our room,she continued to,virtually, berate me for trying to explain the problem. Then as she showed the instruction for the use of the shower,she spoke to my wife and I like we were teenagers,we are very senior and experienced travellers not expecting ant tirade from her.I then pointed out the broken toilet seat,exposing a filthy mark,she then informed us that "well I can't do nothing about that until tomorrow a broken curtain rod,the thermostat falling off the wall,making it inoperable,the bath waste was blocked,so after,at last having a shower,one was standing in 3ins of water,again not very nice, requesting another room at this late stage we were told that there were none available at this time.This girl not only let herself down,she has let the whole team down. The outside of the whole building was very "sad" and could do with a small amount of maintenance,such as sweeping up cigarette butts etc. On meeting with a manager in the morning we received a $20 discount as a placation, staying again? ?....No way. "Outdated, overpriced and poorly maintained"
We decided to get a hotel room on our way back home from camping for a week where we did not have the greatest options for showers or beds and I was excited to get a room at the Best Western because of the reputation that follows it. We initially got in a little late and were told that we should be satisfied with our "pet friendly" room, which we did not need or book. In fact, my children have allergies and we did not think it was a great idea, but when we approached the front desk about it they told us that they were completely full and that they didn't have another room. We did let the kids play in the pool which was the only nice thing about the hotel. I was very excited to get a nice hot shower, but when I went into the bathroom it was filthy and when turning on the water could not get it on a consistent temperature. It would go between freezing cold and burning hot. We decided not to even bother bathing the kids because of this and decided to just go to bed. When it started to get warm in the room the furnace would not turn on!! When I finally got it on it was stuck at 80 degrees and did not stay on long. At this point it was 3 am and I was to exhausted to even complain to anyone about it. This was a terrible experience and was way too overpriced for what we got. I would have rather slept in our tent trailer! "I'd rather sleep in my car." Wow, how can Best Western allow this? The place is dated, dirty, noisy, has major plumbing problems, very loud HVAC, terrible TV reception and picture, and is next to a homeless camp. The breakfast was edible. Others have said they had no issues. We had nothing but issues. Couldn't wait to get out. I'll never go back. Oh, I almost forgot. It's pricey! I was very happy with the room, internet and hot breakfast. I travel a-lot and it was nice to have zero issues (hard thing to do). The staff was nice and the location had a good view of the mountains. The room was outdated, dirty, maintenance was unkept. The walls were dirty, the bathroom was gross, there were hard water stains all over the bathtub and orange mildew in the bathtub, the handle and the shower was broken. I would never stay in this location again. Dear The Wonder75: I'm sorry you felt the room was outdated. We are starting a renovation that will be modernizing the entire property. This will be completed in 2020. It is a total face lift. So this will be taken care. In the other review you did you stated that the handle was semi broken. I'm not sure what you were talking about but the handle for the shower does work. You have to pull out on it and not turn. All you would have had to do was call the front desk and we could have came and helped you. I personally went and checked the room and could not find any mildew. The housekeepers use a orange cleaner maybe they did not clean it off. They should be cleaning it thoroughly so I do apologize. Thank you for your comments because we do take seriously. I would look forward to talking to you about your room. Please give me a call if you like. We had to stop at the last moment and count on Best Western. AAA discount got us under $100. Breakfast was good and personnel excellent. Our floor was not vacuumed but clean enough. Quiet and good beds gave us a great night. We've stayed at this motel many times, and have always had a peaceful, restful stay. The rooms are clean, and the staff is great. And the air conditioner works great when it's warm outside. And Walmart is right across the street in case you need anything. "Bring a mop and spray odor eliminator." This is the only Best Western that was close enough to Fernley that allowed dogs. We were very disappointed in the cleanliness of the room and the dog area. First the smell of cigarettes in the room was overpowering. We complained at the front desk and they offered to spray the next morning. The girl at the front desk asked if anyone was smoking outside our room when we arrived. We said no. She also said some of the housekeeping smoke and that may have been the cause of the cigarette smell. She also said they couldn't enforce smoking because the didn't have to proper signage. All excuses in my book. The floors were filthy. I actually bought a mop and odor eliminator spray to help clean the room. The other issue was the heating and cooling system. It worked but the amount of dirt and debris in the vents were disgusting. I do not recommend staying at this hotel. Keep driving. Find another. Dear Judith R: Thank you for letting us know about your stay. Unfortunately, people do still smoke in our rooms. If we catch them we do charge an additional $150.00 for smoking in the room. We do have a chemical that does removes the smoke smell. I will inform the clerk that she should have taken care of this immediately instead saying they would do it tomorrow. She is a new clerk but that is not an excuse but I can assure this will be taken care of. I have talked to housekeeping in regards to the wood flooring. Again, I apologize that we did not meet your expectations. "Nice break very clean property!" Need to take a break from a road trip. I always try to stay at Best Westerns this one by far was one of the best! Convenient to food and a super Walmart across the street! Staff was nice and very accommodating! Will definitely continue to stay here when driving through! "Great place and good value"
The room rate was reasonable and the room was comfortable. 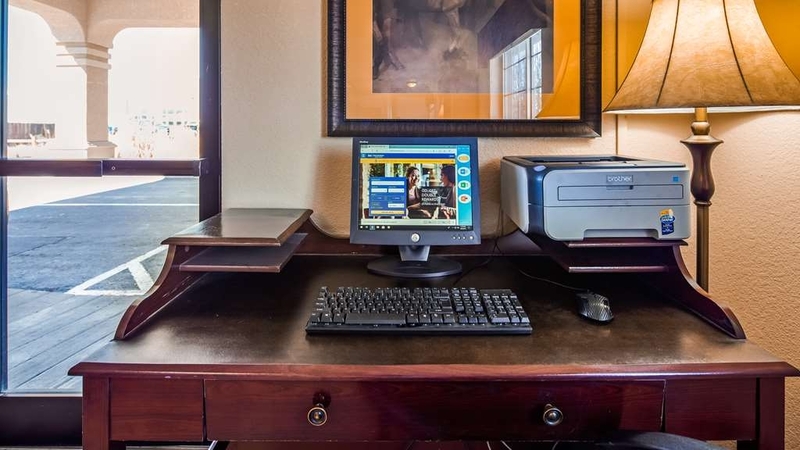 The staff was very helpful and offered lots of options in regards to room and rates. The breakfast area was clean and the options for decent standard hotel breakfast. If your just looking for place to crash while traveling this place is great. 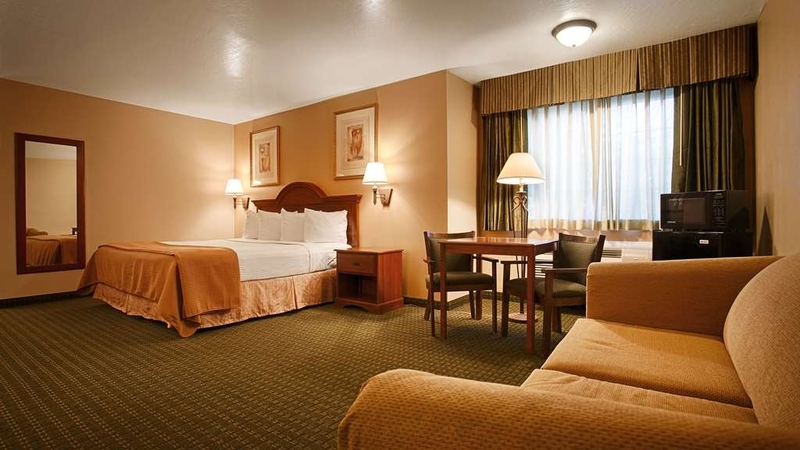 "Very clean and a very helpful staff"
The location of this hotel was great because it was close to our family's home. The hotel staff was excellent, especially the evening crew. We stayed two nights. The rating was given because on the second day the cleaning staff did not clean the room. There aren't too many hotels around this city and the name Best Western I always thought you can't go wrong. "Used to be a good deal"
You don't save $ with the extremely limited breakfast offerings in a tiny room inadequate for the number of guests. Go elsewhere. The rooms are OK. Because of the extremely limited restaurants in the area, you should skip Fernley if you can. "Good spot east of Reno"
BW in Reno which was pet friendly and where we stayed many times en route to Las Vegas was no more. The BW in Fernley was a delightful alternative: smaller, friendlier, accommodating to dogs. Good breakfast with scrambled eggs, bacon and sausage gravy. Did not have to settle for cold boiled eggs and yogurt this time. Although the hotel was clean and nicely decorated, it also had its problems. The pillows on the bed were very undersized. There was no TV guide. When we asked for a good place dinner, we were directed to the casino nearby. It was terrible, but cheap. We asked for GOOD. Much of the current staff is new to this BW or also new to the area, so very little help there. I tried to make it to Reno, but had to stop here for the night. The room was great & got a good nights sleep & enjoyed the breakfast in the mourning. It was Hot August Nights weekend which is why I figured they charged what they did for the room. After finding out what weekend it was, I'm glad I didn't make it to Reno because rooms would have been near impossible to find I'm sure! Anyway, like I say, the price was the only complaint here. Great place to stop. Cheerful helpful staff, easy parking with with my trailer. Right on the traveling route, nice hot breakfast included. I was ready for a break on my long cross country drive, and this was the perfect stop. Fernley is an older town. This BW was very clean, and the staff was very pleasant. Location is super close to many food choices, as well as a Starbucks. With Walmart across the street it is helpful for those little things that we forget to pack. I feel they are a tad high priced, but other than that, worked out great for our stay. This was one of our annual trips to have a get together of all of our friends from Hawaii to experience golf in the NW and adjoining areas. The Best Western provided us with great service and nice rooms for a reasonable price. Got some great help from the front desk gal when I got some computer scam going which I couldn't handle. Will be back to a best western but most likely not in Fernley. This is definitely not the Best that BW has to offer. Reservations and checkout was done in a professional & efficient manner. The room was clean and tidy and looked like it is somewhat "newer". 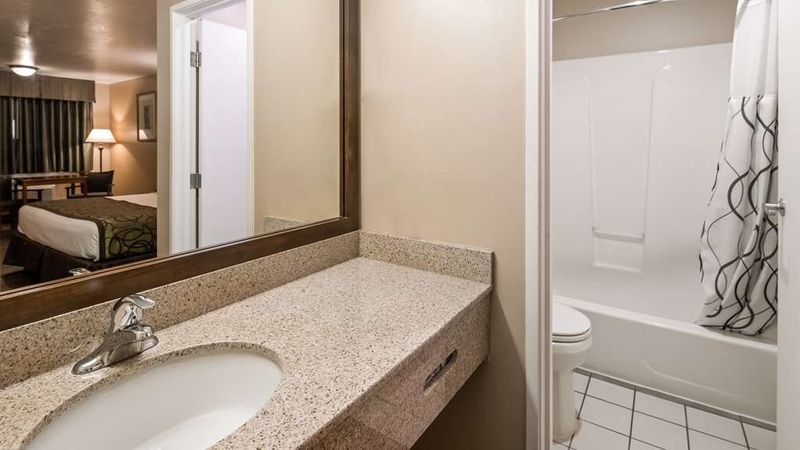 However, the Bathroom definitely could use an update and some work. The breakfast room was quite small and with 5 people in it, it seemed crowded to get a plate. Overall, it did meet expectations for a hotel and the bed was quite comfortable. "The least accomdating staff in many years." I stayed in fernley in august in the middle of a trip. I spend 60+ nights a year in hotels and have typically had good experiences in Best Western Hotels. I had called when making the reservation to make sure they had space for a small RV and was assured they did. When we arrived, the manager rushed out and chastised us for parking in their lot. When I explained I was staying there and had been told there was RV parking, she shrugged and said she was very busy and did not have space for us. We would have to park a block away in the Wal Mart dirt parking lot, full of garbage, semis, and potholes, then run across the 4 lane busy road to come back and check in. The rooms were average, and nothing about this hotel stood out as exeptional. The service and attitude from staff was atrocious. I've stayed at the super 8 in fernley before, and will stay there next time I drive through. The rooms are comparable, and the staff is worlds more accommodating and service oriented. And the rooms are less expensive. "Dirty under ware in bathroom and dead bugs in bed"
I was incredible grossed out with my experience at this hotel. I got to this hotel and unpacked all of my stuff. I went into the bathroom and there were dirty red men's under ware on the floor. In addition, I found crumbs and a dead bug in the sheets. I took photos of all of the items and went to the front desk to have someone come clean and she advised that she was the only person there and couldn't leave the front desk. She did provide me with another set of sheets so that I could change me own bed. I was so exhausted that I went back to my room, changed the sheets ( trying not to touch anything as I felt grossed out), and tried to get to sleep. On top of everything else, the air conditioner struggled loudly as it attempted ( in vain) to blow something other than hot air. 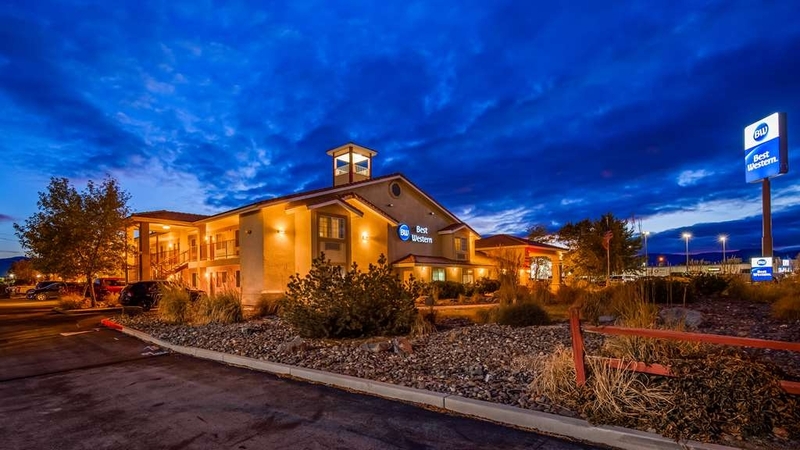 A perfectly acceptable, dog-friendly hotel in a stop-over town near the California border and Reno that has a Starbucks, Wendy's and other good road food options for travelers who would prefer not to stop in Elko or Winnemucca. The Best Western in Fernley is a very reliable place to stay. 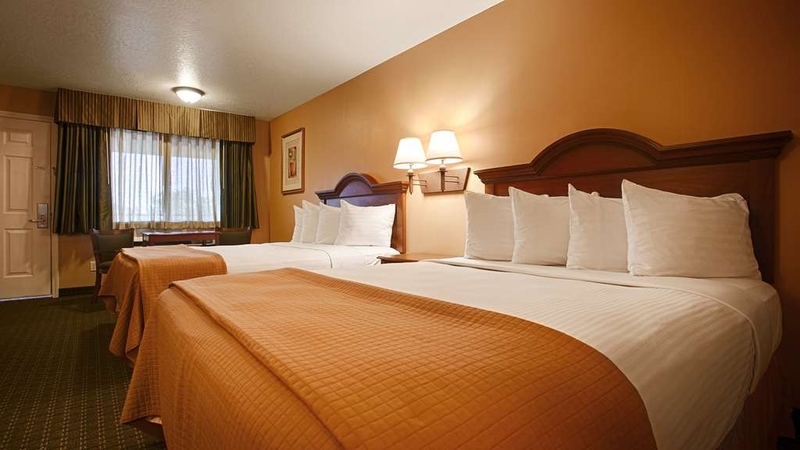 It is very clean, with comfortable beds and the usual Best Western breakfast. Importantly for the summer months, the air conditioning is very good. Even arriving after midnight, I always find the staff pleasant and accommodating. Good Place to Stay. Fair price for the room. We stay at Best Western whenever possible and we much appreciate the government rate offered to military retirees such as myself. This trip was on business and is the first to this particular location. Recommended.. Wonderful people and great pet experience! Staff was more than willing to go out of their way to make sure we were comfortable and that our pets were happy! Good location and would recommend this hotel to anyone traveling with pets! The rooms were quiet and clean. Breakfast was good with a good selection breakfast items to choose from. Very easy access on and off the interstate. Staff was helpful and friendly. Only problem someone set our room cooler to 50F before we arrive so room was very cold when we arrive, this was easily corrected. "A discredit to any hotel chain"
After this stay, where virtually everything was horrible from shower heads to cleanliness to exterior acceptability, we decided to never again stay at a BW. Maybe a Plus or Premier if that is all that is open at our destination, but never a 2 star. "Best Western Fernley Inn, Fernley NV"
I was impressed with the quality of the staff. I had to cancel my first reservation, did so after the deadline, and they refunded my money anyways. I re-booked. The staff was super friendly, talkative. One employee went out of her way to bring me plastic bowls for my pet the day I was checking out -I had adopted a kitten traveling with me on the way home. The town seems industrial, but, the hotel is nearby a lot of places to eat, gas stations and was decent. The room was clean, bed was comfortable. The decor could be updated, a bit worn, but everything in the room was in working order. "Remember the state you're in." The staff was great, the hotel is overpriced for the location and as a Nevadan going completely non-smoking is an inconvenience for a good portion of your customer base. Many guests having to stand outside their rooms in the parking lot at night. "OK for an overnight stay"
Passed through on our way to California. The staff was very friendly and helpful. The rooms and bathroom were clean. The breakfast was descent, but the dining area was small and cramped. There were a few bugs on the floor and flies on the wall, I guess due to the fact that the room door opens directly to the outside. The shower head was difficult to adjust, and when adjusted it sprayed erratically. This is an average property in an average location at a very high price. I stay regularly at Best Western properties and this was very disappointing and very expensive. My advice would be to keep on driving. 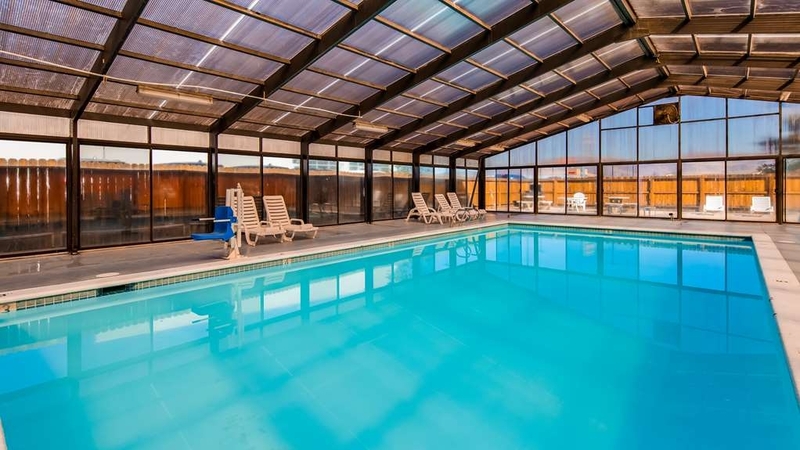 "The Old Un in Fernley Nevada"
The Best Western Fernley Inn can be described as a reasonble quality commercial Hotel, which provides comfortable accommadation, at a reasonable price, the Staff are helpful and accommadating, but there aren't any "frills". 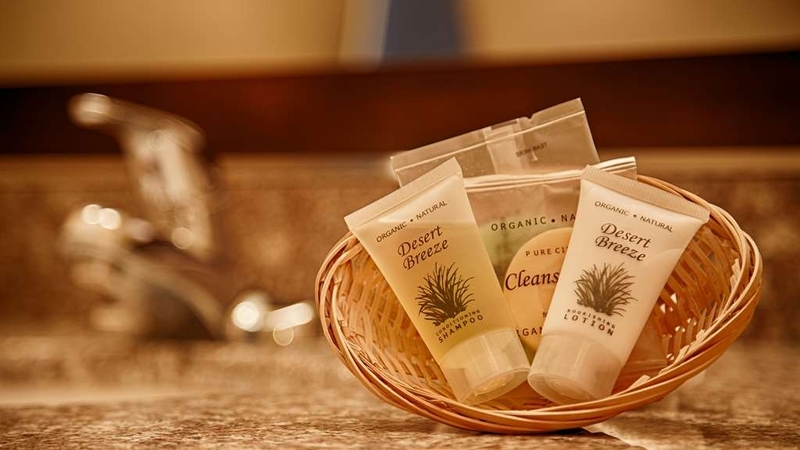 The staff was very helpful and friendly The rooms were very clean. They had a good variety of breakfast choices. 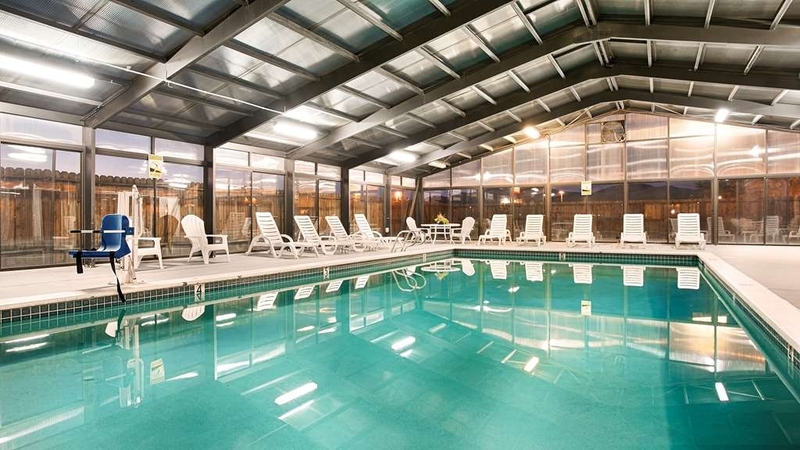 Had my family with me and they enjoyed the pool and the area the best western was located. "Sticky carpet and strange odor in roon"
Had to keep my shoes on while in the room. Sticky substance in several places, especially in front of the sink. The room smelled like a bear's cave. I think they tried, unsuccessfully, to mask the smell from a previous guest that smoked cigars. when I reserved the room I was not informed that the advertised pool and spa was not availibe. Very disappointed with this branch of the Best western chain. "Bad smelling room, A/C blew worst smelling air"
Room smelled like a old bar, turned on the A/C and it blew worst smelling air - pm desk clerk could care less. She stated they were full so she could not give us another room. AM desk clerk was a very sweet person, said she was sorry and took 1/2 off room. Breakfast area is VERY small, there was no room even get to the food - we went to a diner down the road. Stopped here on our way to Grand Tetons. Although more simple than most Best Westerns we stay in, the room was clean, bed was good and we got a quiet sleep. Breakfast room cramped, cereal had to be eaten out of box, but all and all, was OK.
We stopped here overnight to our eventual destination, Twin Falls, Idaho. The front desk personnel was very pleasant and helpful. The room was clean and very comfortable. Breakfast was the usual complimentary breakfast; sausage and scrambled eggs, fruits, etc. Parking was well lighted. Would recommend this hotel. Wife and I decided to move cross country and this was our first stop after leaving San Francisco. Staff was definitely accommodating and gets top marks. I have a newborn and a 80 lb dog and they made us feel right at home. Some negatives and why I gave a 3/5. Room is definitely dated and looks it. Most negative of all is the air conditioning is pre-set and locked at 80!!! This is unacceptable!!! In summary: Mostly positive but a couple big negatives. Stopped in Fernley to visit grandson and family. Motel was clean, beds comfortable and very friendly staff. Apparently I had neglected to request a ground floor room. Unfortunately, although we checked in relatively early, non were available. These old bones don't do too well on stairs. My family was moving so we driving 2 trucks each pulling a trailer. There was plenty of safe parking for us. We were also traveling with 4 dogs, & this Best Western has a few rooms that welcome dogs. We very much appreciated that. Highly visible location with easy access. Exiting to other locations is a little more tricky as you can only exit to the right, which is away from other community properties then you have to flip a "u turn" to access any other parts of town. 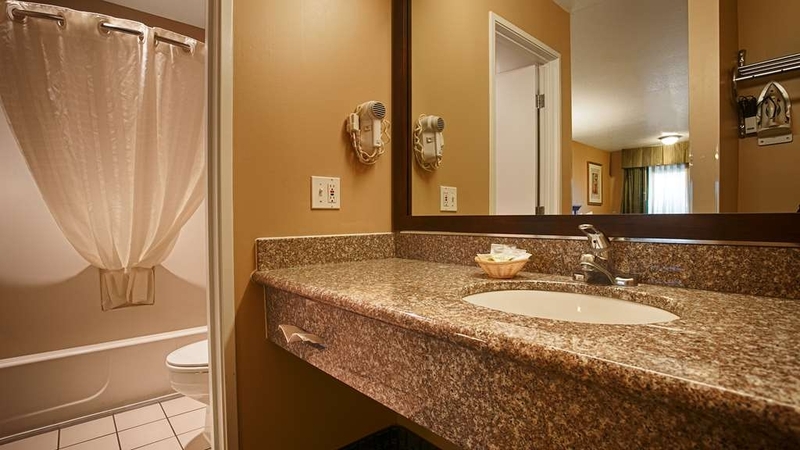 But you can always count on Best Western to have a nice updated décor and be clean. We did brings our fur babies on this trip and were given a pet friendly room. Although the room was clean the odor smelled of pet urine. They attempt to mask the odor so it wasn't totally overwhelming. No one cleaned our room while we were out all day Saturday, Came back to unmade beds and dirty towels. It was late and we were tired and didn't want to deal with calling the front desk to complain. Mattresses were not comfortable, low quality. Room was basic, about as expected for the price. Great hotel, clean and quiet. Good staff and great service. I had to drive from Utah to Sacramento and back in 36 hours. Hotel was a great place to crash and rest on my way home. I would definitely stay here agsin. Late check in for a bed to sleep in. We called at midnight and luckily got the last room. Bed was comfortable, staff friendly and great breakfast. Window didn't have a lock, but we were to tired to care. Recommend this place for a room to get some rest. Easy to get to and a very nice property. Helpful staff and quality service. Breakfast was good. We stayed only one night on our way through. Would recommend this hotel for family and friends. Very easy to get to and lots of stores and restaurants close by. The staff members are always friendly, and the price is reasonable. I generally stay here whenever I travel through Nevada on I80 because this motel has spacious rooms, and a quiet yet central location. After driving all day, it's nice to be able to walk to nearby restaurants and several stores. Poor amenities There was no hot water in the first room assigned and in the second the taps did not work properly. The internet was so weak could not be used. Breakfast was OK Good location near the highway but no help in finding a dinner restaurant. Best deal for the money. Breakfast is as good as other more expensive hotels. Rooms are clean and modern. Quiet and comfortable.Staff is friendly and helpful. Conviently located next to restaurants and shopping. "Pretty basic no frills place to lay your head for the night." Stopped here at the end of a long road trip and was expecting a bit more than I found. This is a pretty basic motel, no frills but it's far enough off the Interstate to be quiet. There's a small continental breakfast which again is pretty basic fare, and I didn't really pay attention to any other amenities so can't even tell you if there's a pool or not. Nevada has some long distances between towns, so if you need to just rest for the night and don't need anything fancy, this will do, but I think next time I'll continue on down the road for another hour or so to get to a larger town with more options. This was a very nice place, room was clean, and the bed was very comfortable. The Staff were very nice at check in and check out. There were many restaurants within a short distance, so it made staying here great. This motel was in a convenient location right off freeway. There were some restaurants close by, within walking distance. This motel was much cheaper than Reno on a Saturday night. The staff was very friendly and helpful. "Most Basic Best Western of our Trip"
First, the people here were really friendly and helpful! Sadly, the facility didn't measure up to the staff. On the positive side, the room did have overhead light fixtures, so it was bright and cheerful. It was also clean and well maintained. Biggest down side was the noise. Noise from upstairs was disturbing. Noise from AC unit was worse! This was one of the new "blast furnace" types that has no "low fan" setting for ventilation and noise masking and comes on with such force that you feel like you are about to depart the runway only to shut off 30 seconds later. These things are becoming increasingly common and I don't know what management "weenie" decided that going to these units was a good idea but I hope that they are sentenced to spend several months living in one of these rooms. A secondary disappointment at this hotel was the breakfast. The area was cramped, the bananas were black, and the rest of it was mediocre at best. "Respite from the Road--Smoke Free!!" The hardest part about driving through Nevada, beyond the boredom, is finding a place to sleep that is both cost-effective and smoke-free. This is an older facility, but has some targeted updates; we stayed one night on the way out to California, and one on the way back, and found each room clean and quiet, beds comfortable, and the hot breakfast in the morning, though in a small breakfast room, was well supplied and kept very tidy throughout service. Good black-out curtains, quiet facility, and not next door to casinos that would make the stay unpleasant. Very nice staff, attentive and friendly. Check-in and check-out took under 5 minutes. Good parking all around the building. For us, the smoke-free status of the motel was key. Since there are no sit-down smoke-free restaurants in what seems like the entire state, I'd recommend hitting the Walmart across the way for food you can eat in your room. stopped at this motel with our travel trailor and found the most pleasant and helpful lady at the front desk called Deanna. she helped us in every possible. not only giving us advice about the town but also so helpful with more places to go to and how to get there.We owned a small business at one time and we told her we would hire her in a flash if she had lived in our town.The rv parking and the motel were veery clean and the food was great. We will stop here again on our way home. We stayed at the Fernley Best Western on our way home. We found it to be clean and had very comfortable beds. The room is set up nice for two people and has a separate fan in the bathroom that you can have off even if your using the bathroom. Overall it was a great stay and the breakfast wasn't bad either. I booked this location solely on the fact it was between Reno and Fallon NAS. I went to visit my son an Active Duty Navy Serviceman and was so pleased with this hotel. It's clean, even though I was told it is a pet room (you would never know). It's clean, the desk manager was really friendly, helpful and when I couldn't open the door, didn't laugh because I didn't lift up on the handle. ?? The free breakfast was great, and the coffee was very good (very important to me) I gave it a 4 Star review only because it is a bit dated. But other than that I would recommend it. Especially for all Families visiting there service person who is at Fallon NAS. "Good Value in a Small Town"
We stayed here in Fernley for a week on a Sierra Club Service Trip. This hotel had most of the basics that I look for--plumbing that works (but the shower head needed replacing), decent towels, standard free breakfast, and the sink separate from the toilet and shower. But the heat/AC was terribly noisy. Within walking distance of several restaurants. Would stay here again. Midway stop over while traveling to wife's high school reunion. Excellent services, pleasant staff, convenient location, well appointed rooms, did not use pool but looked inviting, Wi-Fi worked well, Breakfast was well stocked and maintained. Noise was due to people in and out all the time; toilet and sink slow to drain; shower handle wouldn't work easily; whole bathroom smelled like sewer leak. Heavy dust on carpet along baseboards. Bed was absolutely awful. Was told best motel in town. Will stay again but will ask for better bed and different room location not near maid station. Great place for a night of sleep. The room was large and bed was really comfortable. 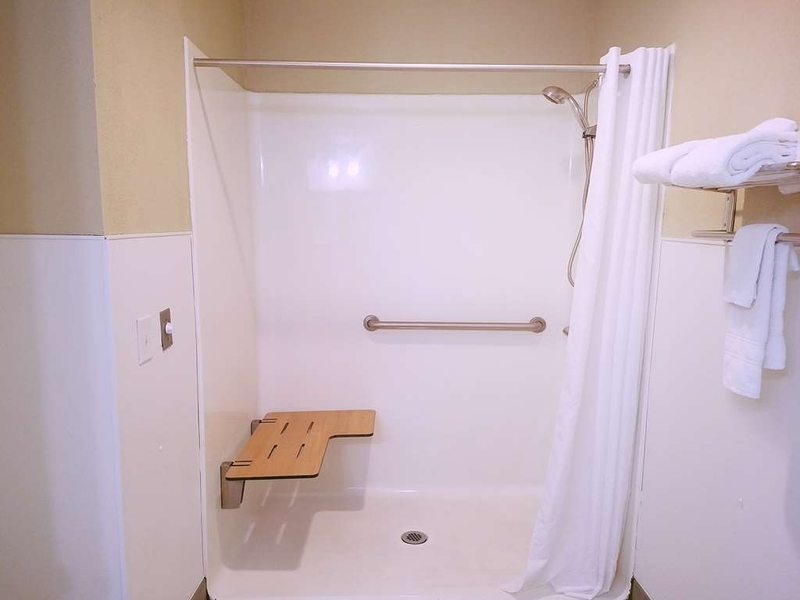 We had a handicap room - non smoking The bathroom was big enough for moving around and the shower was adequate with hand held shower head. The large refer was big enough for re freezing our water. TV was ok, they had a table & chairs which was great. Perfectly located, clean and well run. Great breakfast in the morning. Helpful staff. Best rooms face away from the afternoon sun. The locks need to be replaced as many of our group had trouble getting into their rooms. Wetting the key seemed to help. Located within walking distance of a dozen good restaurants. Great place to stay. "Nice Option Outside of Reno"
We were looking for a hotel out of away from the Reno strip on a road trip from Miami to San Francisco. Being it was the weekend all the reasonable and well rated Reno options were booked and rooms were $300+. This hotel fit the bill and the budget we paid $135. Fernley is a decent size City about 30 mins East of Reno and has decent food option beyond McDonalds. On the hotel itself: It's nice because it's tucked in and not visable from the road which keeps your stuff safer. It's a no frills motel style hotel. The front desk was nice and friendly. Again the lobby was not fancy. Some hotel lobby's are nice and the rooms are crap but this was the opposite in that the rooms are far better than the lobby. They have a computer if you need it. We had an issue with getting into our room and the front desk was nice enough to walk us to our room and show us the card key was working but we had to pull up on the door not down. The rooms are clean and renovated much better than what I expected by looking at it from the outside. It was nice to have a table to sit and eat at. The beds were comfortable enough. There was a large dorm type fridge and a microwave. The wireless is free and excellent. I was able to add new movies to the kids iPad with no issues and for free. Some hotels make you pay extra for their highest speed internet. They have an indoor pool and offer a hot breakfast on the weekends from 6 am to 10 am. For sure a safe, decent and clean option. Nice basic, one-night stay in a very clean and comfortable double queen room on the 2nd floor. Staff was friendly and professional, breakfast was ample, and the location is easy for egress to and from Interstate 80. Good for a basic stay. Internet worked well, too. Access to a pool that I didn't use but nice to have available. We chose this motel based on Guest Ratings. While the staff was very friendly and accommodating, the motel grounds and room furnishings were in bad need of an upgrade. The room was clean, the bed slept well, and noise was minimal. In spite of the good points, we would probably choose to stay elsewhere next time around. Clean, friendly, convenient - right across the street from Walmart. Great place to stay before heading to the Playa. The breakfast was surprisingly good with real eggs and a variety to choose from - including waffles! Stayed here last minute and found the place to be just fine. Good chain quality place, clean, well maintained. Fernley is kind of a one night stop but that being said staying here was a good choice for us. Was told by the General Manager the price was inflated due to Burning Man Event. Burning Man was 10 days away. The breakfast was substandard and the juice? Really! The shower ran from warm to cold during the whole shower. Not a very good place to stay, especially for the price. I don't know who chooses to stay in Fernley, but I did. It was the start of a cross country journey and I got a late start from the Bay Area. I didn't want to stay in Reno, as I chose to get some extra miles in and stop further down the road in Fernley. I rolled in late, around 10pm. The receptionist was closing down the pool and hot tub, which took some time for her to get back into the lobby. Absolutely no problem. She was extremely friendly and apologetic. I got my room and drove around the hotel to find a place to park. The parking lot was full, but I happened to find a spot open directly in front of my room. There were a quite a few people hanging out in front of their rooms, smoking, drinking, talking. I was thankful none were near my room. When I got into the room I noticed it was slightly dated, but very clean. The WiFi worked great and the bed was comfortable. Upon check out, I was once again greeted by a very friendly / outgoing receptionist. She informed me of the breakfast and wished me safe travels. I'm not a breakfast eater, so I didn't opt for the breakfast. I did peek in and noticed the room was packed with families and people. There are a few quick food options near the hotel. There is a Starbucks near as well, a good bet for those driving a long haul. The hotel is a nice bed along the way, not much else. Staff is great and is big benefit for this hotel. The hotel is fine, if you're just looking for a nights stay it'll be fine. The most friendly staffs. Staffs know us by name because we stayed here several times during a year. In room coffee is much better here than elsewhere. This hotel is within one mile from the 80 Freeway, very convenient. Across the street is a Super Walmart and plenty of decent restaurant around beside the fast food joints. "HORRIBLE RECEPTION, BROKEN HOT TUB, 130 degree air temp around pool"
When we first rolled into town we were told this best western was old and we should try somewhere else...I'm glad we didn't! This hotel was nice clean and the staff was super helpful! Plus the breakfast was really good. After traveling all day and temp was at 106 outside we deiced to stop instead of pushing through and staying in Winnemucca. This was a smart idea. 2 queen beds, super clean, with a great AC unit and a better price then Winnemucca. Grocery store and a few fast food placed nearby. "Good quality hotel, not fancy but recommendable"
Friendly reception desk staff gave us a key despite a somewhat early arrival. We were also offered pool access which we did not need (so this review does not address this part). The room was quite ok, clean and well maintained. The hotel is well located near a major supermarket and alike. Breakfast did have healthy choices. For a single night a recommendable choice for the price. We are on a cross country trip and have preferentially chosen best westerns. This one was friendly and clean. The room was older and could use some new paint and a new microwave but everything worked well. Breakfast was good and the staff was wonderful as we have come to expect. Good location to stop on a road trip to Idaho. 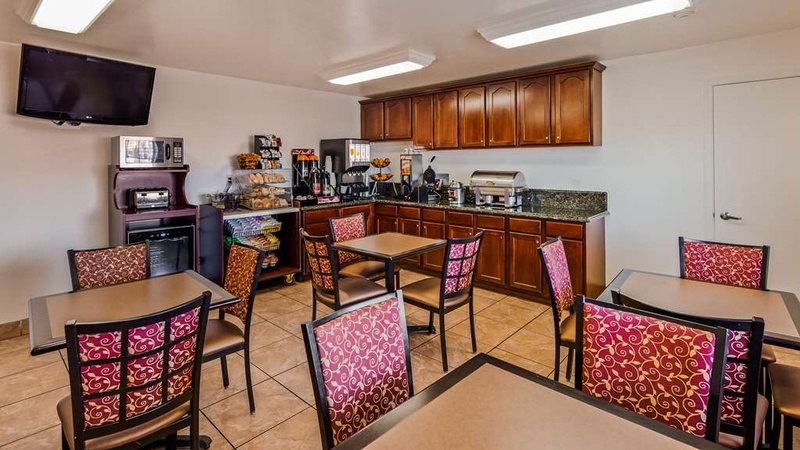 Conveniently located and the town of Fernley has a lot of conveniences, Walmart, Starbucks, restaurants. Nice, large pool with coverffor year round swimming. Would definitely stop here again and would recommend it to families. I have definitely stayed in better Best Western Hotels. The staff was incredibly friendly and helpful. It's the facilities I wasn't impressed with. They were run-down and in an unsafe area. My vehicle was vandalized in the hotel parking lot. The room in which breakfast was held was small and stuffy. Breakfast was not well stocked and many people were scrounging to find something to sustain them. I think this particular chain needs a remodel. Aesthetically, it's a 1 1/2 star hotel. "Nice and convenient but needs some repairs"
We were on a road trip with our kids and this hotel was very convenient, close to a major highway. The room was nice and clean but a few repairs need to be made...electrical outlet didn't work, the AC unit cut on and off all night and needed to be adjusted, screens in pool area need to be replaced. The staff was very friendly and the breakfast was good. I would stay here again. This hotel is right off the freeway but pretty quiet. The bed was comfortable and our room had a nice long dresser. Very clean, great customer service. The breakfast was the usual fare, nothing special. The pool area is nice. 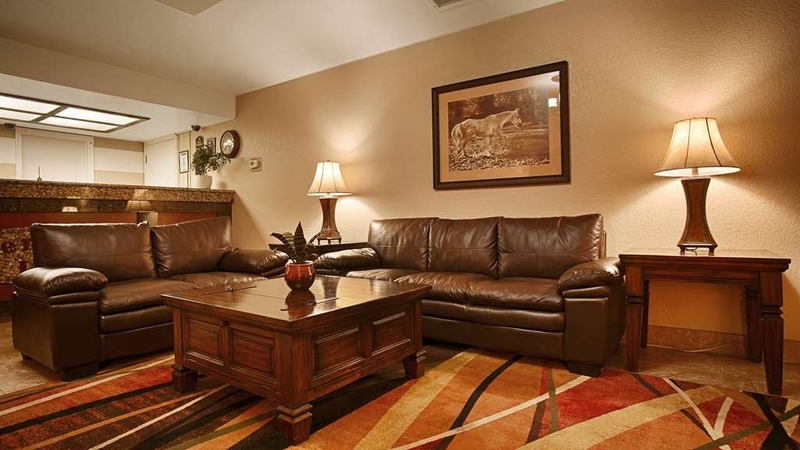 I found the Best Western Fernley Inn to be well-maintained, clean, and comfortable. It suited my needs perfectly for a quick, 1 night stopover stay. It appears to be an older hotel, and there isn't an elevator, but the price is very fair. Overall, it's a nice, safe choice for traveler's on a budget. There is ample parking, the beds are comfortable, staff are friendly, the breakfast is plenty adequate, and the location is convenient. The staff was friendly and helpful. The building looked good and well is maintained. the location is easy to find. The room was clean and well maintained.It has a large breakfast bar but the best part of it was the waffle. "Convenient stay enroute to California." We had reserved a King room, pet friendly. When we arrived there was one harried desk clerk and lots of people needing attention. She found our reservation and gave me our keys. My husband was in process of getting luggage when I opened the door and found it was double queen room that had not been cleaned or made up. I walked back to office and the clerk was appalled. She walked with me to a room next door, which had not shown up as rented, and determined it was not available. So we walked back to the office and she told me that she had no more pet friendly rooms; however, she did put us in a double queen room that was "not pet friendly" and waived any additional fees. Our clerk was very kind but appalled that the shift before her had assigned guests prior to her shift. It all worked out and she assured me that we would not be charged a penalty fee (as we had been in Wenatchee at Comfort Inn). I would stay there again. The breakfast was good and a lovely Hispanic woman worked feverishly to keep everything spotless and keep the food coming. The Fernley Inn is situated in a good location: 1-About 50 miles up to the old gold rush town of Virginia City including the route will take you up the 6-mile canyon road which was important to the gold mines & 2-the Inn is located across the road to a new Walmart.& 3-many quick serve eating places close by. & 4 nice clean rooms. The B/W motel was almost to it's name "Paradise" but not quite. It is a very nice/quiet motel and location. The parts that ALMOST get it to Paradise: neat and landscaped grounds with a golf course & club house in the back & nice/clean restaurant. The down side---the pool area, which looked to be nice, was locked and a sign said closed. The room we stayed in could use a mattress upgrade. We stopped here to sleep while driving cross country. Rooms clean, friendly staff. Restaurants, Walmart, Starbucks, Wells Fargo all nearby. Did not stay for breakfast. Only disappointment was for our kids when they found out the pool was closed. horrible nights sleep due to bed and pillows. small breakfast room. staff was wonderful and very friendly. Dog area could have used a really good cleaning but that is due to lazy dog owners not picking up after their dogs. "A few things need to be fixed"
The refrigerator did not work. The front desk told me that they could not give us another one as that would leave the next person checking in without a refrigerator. She sent the maintenance person to check it out. He agreed it did not work so he went to the next room and exchanged refrigerators. When we tried to take a shower in the morning, the water would not come on. My husband went to the office and asked what we should do. The office person came back to our room and said you have to really pull on the handle to get the water to come on. She said that it should be fixed. When we ran the air conditioner, it sounded like a B52 bomber was going to take off. Maybe that should be repaired also. Would think twice about staying here again. Good room and very clean. Great refrigerator with room to freeze a few items. A little noisy since we were under the stairs and next to ice machine. Breakfast was very good with lots of options. A little less expense compared to nearby Best Westerns and easier to get into because more people go to the other cities around the area. I would do it again. These people really care about the guests. The room was immaculate, the food service delectable and hot. Management was extremely helpful in assisting me with a reservations mix-up. I totally recommend this establishment to all travelers. "Nice location, clean pet rooms"
We stopped at this place road weary and tired and were glad to find smiling helpful staff. We were traveling with a cat so we were pleasantly surprised to find the room clean and not smelling of dogs. The breakfast was good, biscuits and gravy, bacon, eggs as well as an array of continental items. There was also plenty of fresh fruit available. This place is great to avoid the hustle and traffic of Reno. Stopped here to break up a long road trip from Northern CA to Utah. Fernley is a good alternative stopover if you want to avoid Reno or can't find a good rate on a good room. This is still a Best Western so not fancy 5 star accommodations but it was clean and the decor was not severely dated like most motels in small towns. I just say that to level set expectations. The bed was slightly better than average as far as hotel beds go when it comes to comfort. Though not a big town, There's a Walmart and several fast food places within walking distance of this place which makes things convenient. I would stay here again if we needed to stop over on a road trip going through this area. Nice hotel with a wonderful staff. Good value for the money. Quiet. The night clerk squared away a mistake I had made with online booking and made sure I was not charged for a mistake I had made. Breakfast was typical for this type hotel; I didn't stay there for the food. "Repeat stay at this location"
All was good. There was a mild odor in the room like a stale food odor. The breakfast included thin greasy bacon and pasty scrambled eggs, not very appetizing. The sausage gravy was good. A variety of other items were good. 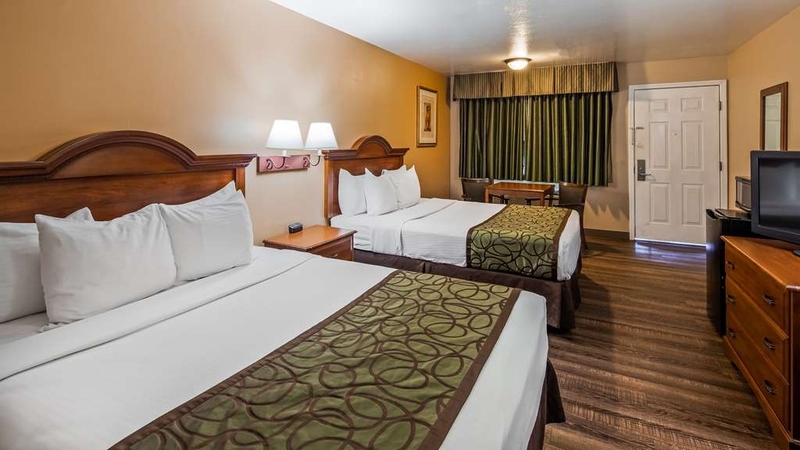 The Best Western Fernley Inn was a great choice on our way from Utah to California. It was clean, quiet, plenty of parking and the breakfast was nice. It wasn't too fancy but it was good. It was easier to stop before Reno in a small town and not be in a casino. The price was reasonable and the room was large. The small refrigerator was helpful too. "not the best western you are use to"
Fernly, about 30 miles east of Reno Nevada, looked like a good option for a night on a drive from LA to northern Idaho. It was. The rooms are not fancy, but up to Best Western standards. Check in easy, good breakfast, lots of dining options nearby. I still prefer interior corridors, but this was not a sketchy neighborhood, so it was fine. Clean. Great rooms. Pretty good service. The breakfast was great, but the set-up is not very good so it makes the room very crowded. But everything else about this hotel was great. And a great price. Parking is difficult because of so many cars and truck with trailers that take up 5 or 6 spaces. "clean and quiet room for the night"
Room was clean and smelled nice. Breakfast was good, a variety of hot and cold food that was ready at 6am. Was supposed to have free wifi but it wasn't working for me - although I didn't try to get the issue resolved. The pool was closed during my visit. Very nice stay! Quality extras in linens, breakfast choices including special diet needs and toiletries. In room micro and refrigerator. Friendly desk staff, quiet spacious room . Would definitely come again. Walmart across the street for random needs. Thank you for a good night's rest. "Pet friendly hotel with designated pet rooms $10 per pet"
This is a fabulous hotel. I love that they have designated pet friendly hotels so only people with pets end up in these rooms and it doesn't cause allergy problems for those that can't have pets. The breakfast of sausage, eggs, biscuits and gravy, waffles, yogurt, etc was fabulous. Bill at check in had two people in front of us and one on the phone. He was very patient, a great multi tasker and polite and business like to all. Ashley on check out was extremely nice too. This is a two story building and I love how you can park right in front of your room.The rooms were extremely clean with nice amenities. Very nice for a moderately priced hotel. Great deal for your money. Easy on and off to hwy 80! We stayed here for one night as we were driving through. It was a good location for us and the hotel was fine. We were able to walk to a place for dinner so we could get a little exercise. the Wi- Fi connection worked fine. "comfort rooms in Fernley, Nevada"
Thieves broke into my U-Haul trailer during the night. They used bolt cutters to sever the padlock, and stole computer equipment. Reaction from the front desk was that they were not liable for the loss. They suggested I could call the police if I wanted to. They clearly have a security problem in the area. "Heap Good for Decent Price"
When every other hotel in the area had jacked up their prices during a three day weekend (including chains I usually stay at), this hotel offered a room at the regular price. I was pleasantly surprised with the quality of the room and breakfast - not to mention the price. I will not only stay here again, but the BW chain will replace my other chains for business travel. We stayed here on New Years Eve. The room was super clean, comfortable, quiet and surprisingly moderately priced. All of the staff were friendly and genuinely interested in making us feel welcome. Restaurants and the casino are within walking distance. We will definitely stay here again. "Poor heating and dirty room"
OK, so we got a dog friendly room due to traveling with the pets, but we don't expect it to be dirty. We expect clean rooms with added fees to take care of stains, etc. In our room with the dogs, the carpet was filthy and the dogs loved it - lots of pee stains and dribbles on the furniture to smell for hours. On top of that, the heater barely worked and we froze our butts off all night due to the lack of extra bedding in the room. Breakfast was a grim presentation of instant scrambled eggs and watery coffee. I'll stay somewhere else if passing through again. 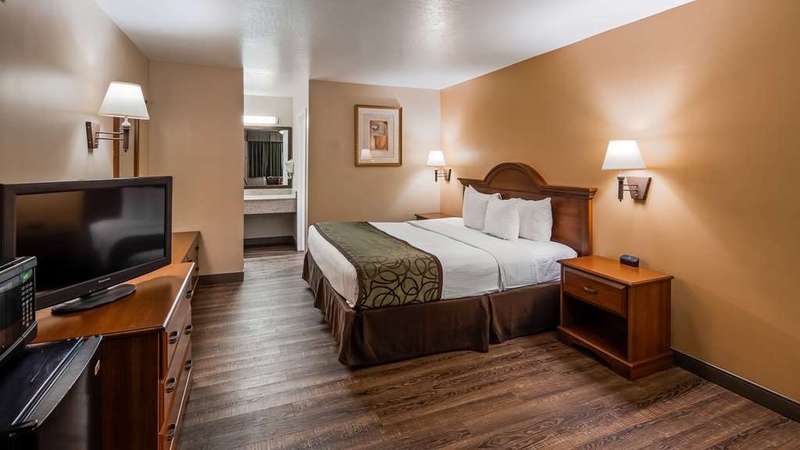 "nice and clean, comfortable, as always at a Best Western"
We chose this because on our travels we have discovered that as far as consistency in a nice comfortable room with amenites that WORK, Best Western seems to be the best choice. We were not disappointed, clean, comfortable, good television lineup, I would recommend this motel. A great spot East of Reno. 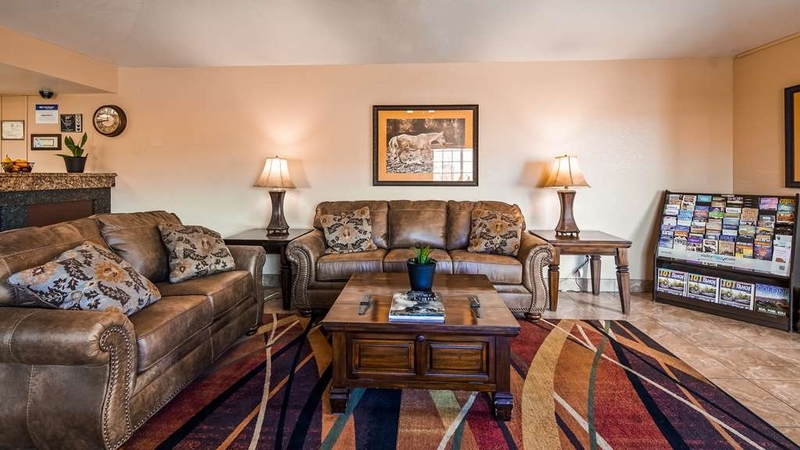 Easy freeway access, close to many restaurants and other shopping. New energy efficient room heating/lighting requires you to leave your key in a slot. This can be an issue in the winter if you're going to be gone for a while. Has campsites for RVs/trailers that are open in the summer. "Overnight stay while traveling through!" Great friendly service. Beds very comfortable. Breakfast was more than I expected. There were hot items as well as cold items. Coffee could stand to be stronger but I carry packets of Starbucks instant coffee to add to the hotel coffee for this exact reason! Would recommend this hotel. I'm on a semi truck with hubby this week and we only have one bed in the truck so we stayed here for the night. Fernley is the best place to stop in a big truck or semi because the Walmart is centrally located and has a dedicated gravel lot for trucks and RVs. The Best Western was really nice. Under $80 incl tax by calling directly to the hotel. I could have gotten it thru this site for $66 but it was late and we needed to stop so I wanted to go directly thru the hotel just in case. At first they quoted me a higher price but I mentioned I could get it cheaper on line so they knocked off 10%. We arrived after midnight and there and someone was actually at the front desk!! The young woman was friendly and polite and professional. Our room was updated, clean and the beds were comfy. The bathroom was basic but again clean and updated. We will stay here again. "Just needed a place to stay"
The Best Western Fernley Inn provided a night's stay for us on our travels. It was clean and sufficient for our needs. Breakfast was standard fare. It is easy on/off I80 as you are traveling. There are several fast food restaurants close by. Excellent location, very nice rooms, most pleasant staff. Good restaurants within walking distance. Try the Lake Tahoe Brewing Company; modern twist on pizzas and appetizers that are out of this world. "check before you reserve it"
If you request a non-smoking room, check it before you hand them your license and credit card, and if you want to use the pool, ask if it is open. 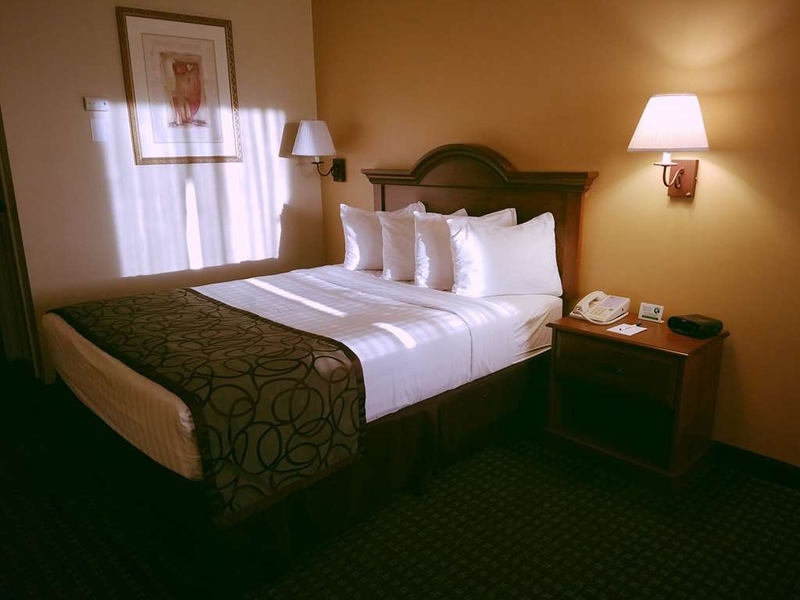 Our experience at the Fernley Best Western was less than what we expected. The smell of tobacco smoke and the cover-up chemicals were "heavy" in the room and they were unable or unwilling to give us a truly non=smoking room, plus the indoor pool had been closed for the winter (as of October 1st), with no notification on their web site or outdoor sign. I stay in Fernley while visiting family, and this is my second time at this establishment. The first time was in 2009, and it was a dated/typical BW motel with the basic elements and needs. Just this week, I stayed there again, and I was very impressed with the motel. I stayed in room #102 and it was really very much improved from my previous stay. Other than a few minor carpet stains, everything else was in tip-top shape. Even the complimentary breakfast was surprisingly good. If you need anything, there's a 24hr Walmart directly across the street. Did I mention that the staff were very attentive and friendly? Will definitely be back next year. "OK, Good AC & Clean"
The bed seemed pretty worn out but otherwise it was OK value for the cost. That said, a casino in Reno is often much cheaper and a lot better if staying outside Fernely is OK. I did for my final night. Am a BW member and this stop did not disappoint. Friendly service at each encounter; breakfast good. No signage coming into Fernley..exterior belies quality and cleanliness of rooms. Older AC a bit noisy on warm night, but applaud them for attempting an energy wise system. 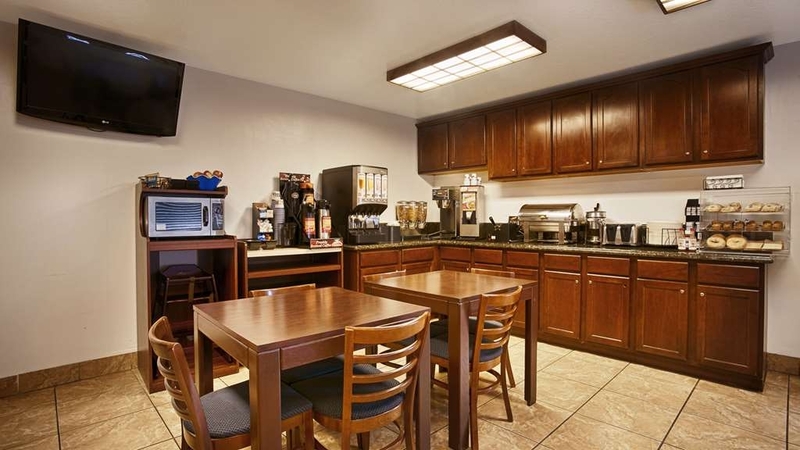 Nothing exceptional about this property, typical western states Best Western hotel/motel. We travel a lot and it takes something quite special to impress my wife and I. This place is simply average, ment for a one night stay.